‘Janet Craig’, Dracaena fragrans are easy to grow succulents. 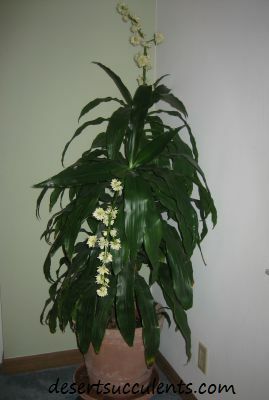 ‘Janet Craig’ is a cultivar of Dracaena fragrans. A synonym of Dracaena fragrans is Dracaena deremensis. Many nurseries and other retail outlets still often use the older binomial name Dracaena deremensis. A Philadelphia nurseryman, Robert Craig, named the plant after his daughter. These attractive plants require minimal care yet produce lush growth. The shiny sword-shaped leaves are dark green and about 3 inches wide and 2 feet in length. Young plants have a lush bushy growth similar to ferns, but as they grow the younger leaves die. The stalk becomes noticeable and the leaves appear only at the top of the stalk. The resulting form is dramatic giving it a tree-like appearance. Mature Size: Up to 10 feet if untrimmed. The ‘Janet Craig Compacta’ is smaller in size and the leaves are less than 8 inches in length. Uses: Primarily grown indoors as a container plant since it cannot tolerate the outdoor cold. As houseplants, they can be placed on the floor or on tables depending on the size of your plant. Inside they can thrive in almost any condition. With the proper conditions, they can grow outside into stately trees. Some people move these outside to a sheltered area during the summer. Light: They will grow slowly in low light but faster in medium light. Direct sunlight even for a short time will burn the leaves. Humidity: It does best at 40-60% relative humidity but will also tolerate drier air for short periods of time. If the humidity goes below 40% for extended periods of time, however, the tips of the leaves will turn brown. Soil: They grow well with any commercial potting soil. Flowers: Under ideal conditions, the Janet Craig will produce fragrant large white flowers on a 10”-12” stalk. Unfortunately, the flowers may slow down leaf growth and alter the overall shape of the plant. The flowers also secrete a sticky sap that covers the entire plant. Most growers remove the flowers as soon as they appear to avoid all the negative results described. Water: The Janet Craig cannot tolerate soggy soil so be sure your container has drainage holes. Pour out excess water in the tray under the plant after watering as well. Water when the top inch of soil is dry. Water until the plant is completely soaked and excess water is draining from the bottom of the pot. These plants are sensitive to fluoride so use only with non-fluoridated water. Fertilizer: There are some very different opinions about fertilizing Janet Craigs. Some say to feed them every month all year with a balanced liquid fertilizer diluted by half. Others say not to fertilize at all unless you are an expert. Each plant and its environment is unique so you may just have to experiment. Pests and Diseases: Watch for mealybugs, spider mites and scale. The Janet Craig is susceptible to leaf spot. Pruning: Trim the brown tips and edges of leaves with scissors. If you trim the leaves to the same contour they still look natural. Propagation: In the spring take a 4-inch stem tip cutting and root it in moist soil. Repotting: If you want a taller plant you can repot your ‘Janet Craig’ annually to a larger pot. Mildly toxic to animals especially cats. ‘Jenny Craig’ was one of the plants studied by NASA and it was proven to remove harmful pollution from indoor air. It will remove most known toxins including benzene, formaldehyde and trichloroethylene.